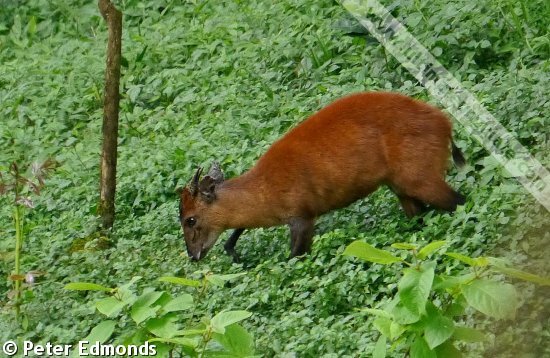 Harvey's duiker is sometimes considered to be a northern subspecies of the red duiker (Cephalophus natalensis), although it is treated as a full species here. Female Harvey's duikers tend to be slightly larger than males. The general color is a bright, rich orange-red, with some montane populations being darker. The legs are deep brown to nearly black, and there is no dorsal stripe. The face is generally red like the body, save for the chin which is white and a dark blaze that extends from the nose, between the eyes, to the forehead. The forehead is usually entirely black, and the forehead crest (between the horns) is typically black in the middle, but reddish chestnut on the sides. Both sexes have horns. Those of males are larger and have very thick, ridged bases; they typically grow 6-9 cm in length. 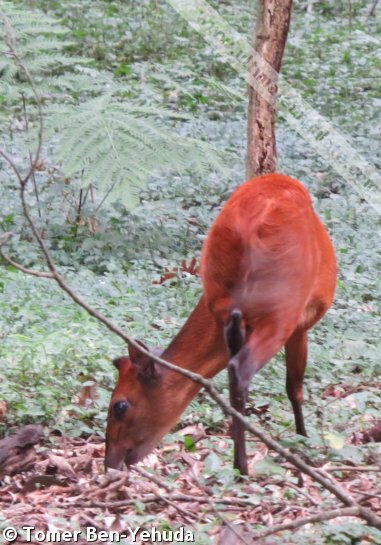 Both Harvey's duiker and the black-fronted duiker (Cephalophus nigrifrons) are red duikers with no dorsal stripe and a dark blaze down their noses. 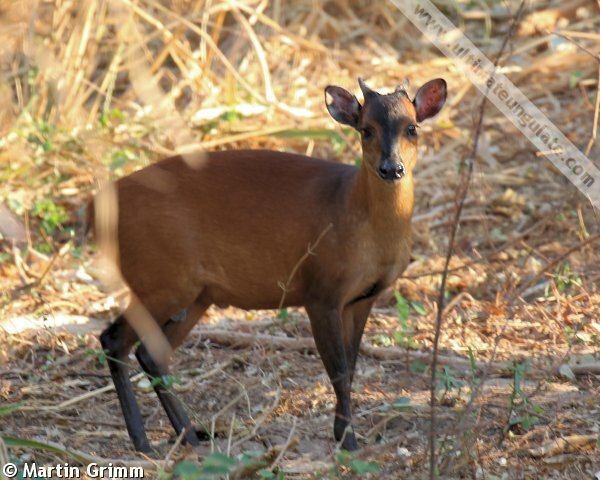 They can be differentiated by range, and by Harvey's duiker's shorter legs, shorter hooves, and smoother coat. Gestation period: Presumably around 210 days. Life span: Presumably up to ~15 years. 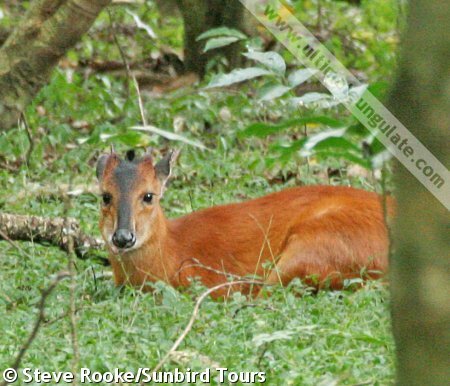 Little is known on the specific reproductive characteristics of Harevy's duiker, but the species is likely similar to the red duiker (Cephalophus natalensis). In northern Malawi, neonates have been observed around throughout the year (Febrary, March, August, and December). Harvey's duiker is primarily diurnal (active during the day), with activity extending into the hours of dawn and dusk. These duikers have been observed foraging on new vegetation in open spaces near forests that are recovering from burns, and they may stand on their hind legs to feed on hanging moss. In Tanzania's Udzungwa Mountains, population densities in forested habitats range from 2.07-13.32 animals per km2; in the Mwanihana Forest of Tanzania, there are 2.4-2.8 animals per km2. When two individuals are near each other, they may communicate with a soft barking call. Diet: Fruits, leaves, and buds, supplemented with moss and lichens. Native to lowland and montane forests (up to elevations of 2,400 m) in eastern Africa. Dense cover and a high diversity of small-stemmed plants are key habitat features. Tanzania remains the stronghold of this species, although it also occurs in northern Malawi and southern Kenya (it may be extinct in Somalia). A relict population may also exist in southern Ethiopia. The approximate range is depicted in the map below. IUCN Red List: Least concern (2016). Threats: Habitat loss and hunting for bushmeat. The total population was estimated in 1999 to be 20,000 individuals, although this was based on very low population densities and is now generally considered a significant underestimate.